Micro-pocket fission detectors have been in development at the K-State Semiconductor Materials and Radiological Technologies, or SMART, Laboratory since 2003. In addition to being featured on the cover of the magazine, a half-page picture illustrating the design and displaying a completed assembly are also included. 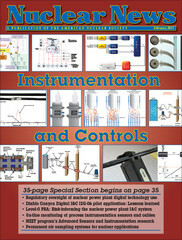 The micro-pocket fission detectors is shown in the top right of the cover, and on page 65 of the magazine.